Designed for the sole purpose of drying your pets, the Flying One Grooming Dryer is perfect for handling any wet-case job. 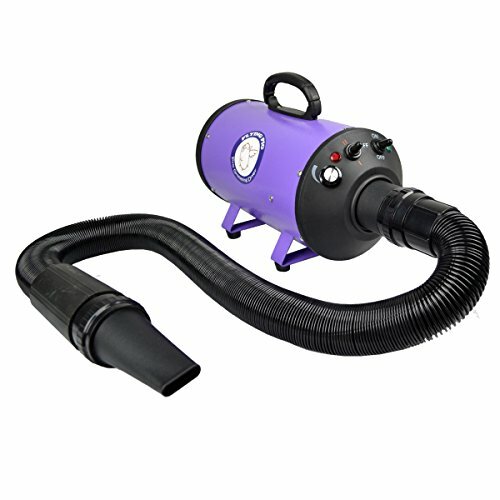 The dryer is equipped with a flexible, strong and durable 10 ft hose that pulls wind from a soft engine resting at the heart of the driver and is easy to pull around or stretch, meeting whatever the user’s needs. The steel frame of the dryer also protects it from damage, encasing the motor inside and providing a solid, easy-to-clean casing and filter. The tip of the hose allows for different nozzles to be fitted on and each nozzle is a sleekly designed head made especially for the user’s hands. This dryer also features a “control panel” with buttons and toggles that allow the user to adjust the speed and temperature settings. Adjustable air speed and heating levels are perfect for anyone who wants to customize their drying experience.